Yes, that was me, singing…badly. Seriously though, Lionel Ritchie aside, you might have noticed that I’ve been missing in action for a very long time. I’d love to say I was living the life of leisure, catching up on Netflix, with a perfectly clean kitchen and not a cookie in sight. But believe it or not, despite the complete and utter lack of ANYTHING on my poor neglected blog, I’ve been up to my ears in cookies, and I am finally here to tell you why! 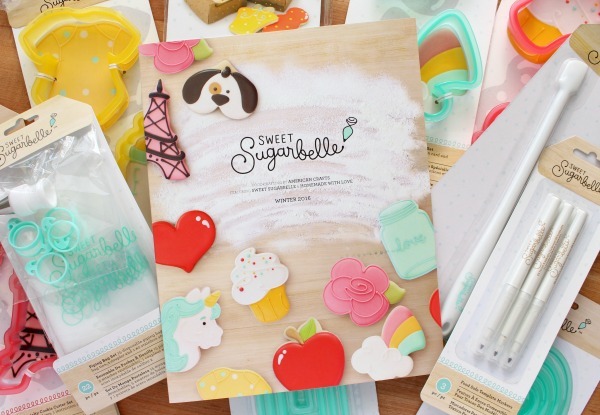 I’d like to introduce the Sweet Sugarbelle cookie decorating product line! Crazy, right? I STILL can’t quite wrap my head around it. 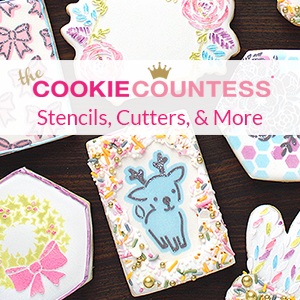 To make a long story short, last year, I teamed up with American Crafts, and together we have been working on a line of cookie decorating products. That’s me at AC headquarters in Utah. 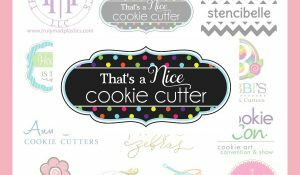 The line will include all the things a home baker might need to create beautifully decorated cookies, without all the guess work. Here’s a sneak peek. This little recipe tin might be my favorite part…today, at least. 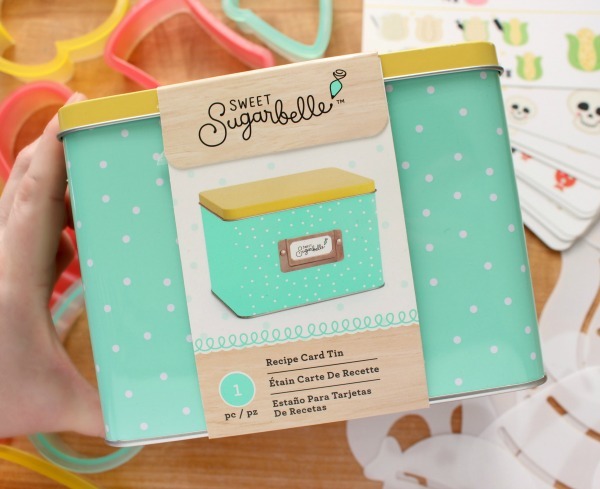 I’m still trying to wrap my head around the idea that name Sweet Sugarbelle, conceived late one evening as a nod to my daughter, Belle, turned into this blog, and eventually a product line. I never in a million years would have imagined a few Christmas cookie boxes would start me on a path that would completely change my future. I am grateful, nervous, and even a little afraid all at once, but most of all, I am excited. Excited to learn, excited to grow, and excited to keep creating new things with the brilliant people I am blessed to have on my team at American Crafts. Most of all, thank you for all of your encouragement and support over the years. Stay tuned for the latest information on product availability and where to buy and hopefully, more of the cookie overload that I hope you all have been missing the past few months. Congratulations! You inspire so many of us who enjoy cookie decorating that I’m sure your product line will be a huge success! Your generosity in sharing all you know has brought you to this place, so please enjoy!! Congratulations! I’ve missed you. Hurry back! Congratulations!!! Can’t wait to start shopping!!! Thank you for all your hard work! Congrats always knew you could do it. Can’t wait to see your products. Well deserved success. Missed your blog posts, but can’t wait to see your product line. Awesome news! Congratulations! I’m looking forward to being a customer! You have given so much to others and now it’s time for you to be rewarded. And yes we have missed you. So very proud and excited for you, my friend! Love you! ???????????! ??????? ????? ????? ????????! Congratulations! Dream of becoming your client! I love you sweet Callye and wish the moon and stars for you! Congratulations, Callye! I’m sure I will want one of everything! Congratulations!!! you are brillant, thans for sharing your cookies with us. Love from Spain. Congrats!! Thank you so much for inspiring me with your creativity!! I look forward to purchasing your products. Best wishes always. A hearty congratulations!!! I wish you all the best. Love your tutorials. Wow, I don’t know how anyone could eat those cookies! They’re way to fun to look at. Congrats!!! I live in Greece, will I be able to buy?? I am so happy for you. The talent that you share with all of us is remarkable. I truly believe, that if anyone deserves the honor of their own product line, it is you. My number one Cookie Guru is finally rewarded for all her generosity! There is not a day that goes by that I am not grateful to you. I use your cookie dough and royal icing recipe and you are my go to when I am trying to find out how to tackle a cookie design. You have been my inspiration and teacher from day one. Congratulations and all the success you deserve. So, so proud and happy for you!!! 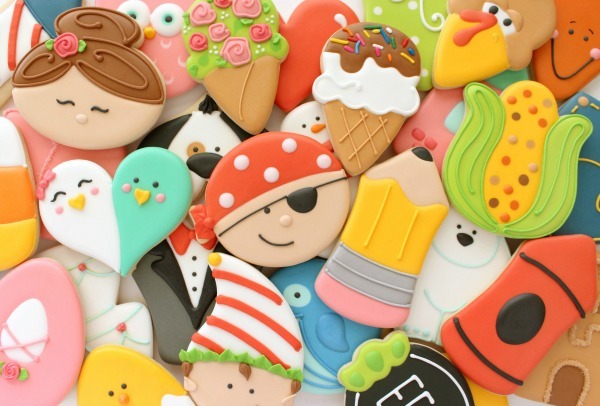 Everything I know about decorating cookies I learned by stalking your web posts. When my friends ask me HOW DID YOU LEARN HOW TO DECORATE COOKIES, I tell them about my Sensai – Sweet, Sweet, Sweet Sugarbelle! Can’t wait to start my collection of SB supplies!! I hope we in the UK can tap into your products …. please don’t leave us out !!!! Congratulations and Thank you for always being inspiring!!! Congratulations. That is so amazing for you and I can’t wait to see what you having coming! Congrats!! I use your info everyday when I decorate! Your post sharing has given me do much confidence!! Cant wait! Love it! So happy for you. Cannot wait to buy your products! Good luck and God speed on your new adventure. That is just wonderful! Your designs are so beautiful and inspirational to so many. Way to go! This is amazing! Congratulations!!! I haven’t met you yet but hoping to run into you next year at Cookie Con. You deserve this and so many of us will be blessed by your “help”!!!! Congratulations, Callye! I have been missing you!!! You have always had the BEST site! Your generosity has been so open and giving! I will be looking for your products since you have shared your heart and soul with us! This Texas Cowgirl is waiting in the sun for your line! Oh Callye – I could not be more excited for you my sweet friend. You deserve all of this…you’ve helped so many of us (dare I say all of us!) and I know this is going to be a huge success for you! XO! CONGRATS! I am SOOO excited to see a new post!!! I have been so worried that I missed the Sweet Sugarbelle bus because I just got started in the world of cookies and you have been SUCH a huge source of information and inspiration for me!! I look forward to using your products!! 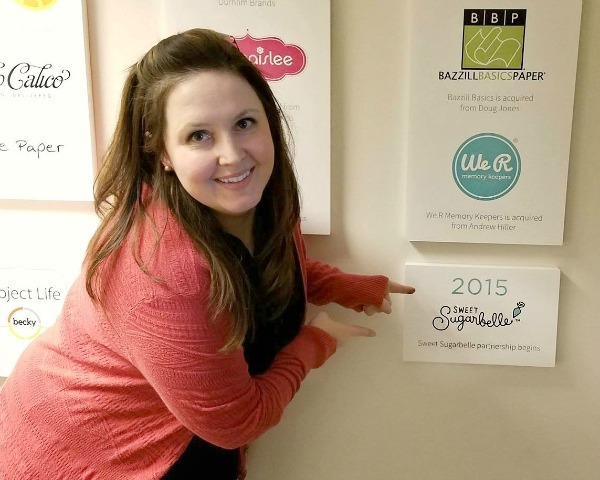 It’s no surprise that your talents led you to this new adventure! Congratulations and thank you for your inspiration, tutorials, and guidance throughout the years – because of you, I have been able to achieve my own level of cookie-ing that I never would have believed 5 years ago! I will be a devoted customer of yours! Congratulations Callye! I can’t think of anyone who deserves this opportunity more than you. Your generous heart & awesome talent have brought you to this place. I wish you much success in all your endeavors! Looking forward to seeing your product line & watching it grow! Callye, Congrats! I am very happy for you and wish you much success! And yes you inspired me to make cookies!! Looking forward to see the products!!! Oh. My. GOODNESS!!!!! This is so exciting! I am on two wait lists to buy EVERY single item! Someday I know we will get to meet, hoping to attend cookie con next year! I am a retired educational Administrator whose live you changed forever. I will not take the time to write my story here other than to tell you Thank you. During my 43 years in public education I hired hundreds of teachers in the fields of Visual and Performing Arts and was constantly on the worldwide search of finding true artists and teachers such as you. It was a thrill to find gifts such as you and your ability to teach and share so selfless all you want to teach others. To know that even in my 60 plus years your gift of teaching has opened a whole new world for me speaks volumes to how many thousands of others whose lives you have touched and helped find this beautiful true art of cookies! Thank you Callye. Congratulations!!! So happy for your success. You have inspired and motivated me and I look forward to purchasing everything in your design line. I was so happy to see a post in my email, thank you for the inspiration and cant wait to see some of your cutters especially- love your ideas and thank you! Congratulations! I can’t wait to support you by buying your products – the same way you support us fellow moms and bakers by sharing your knowledge, designs and inspiration. Hard works always pays off and I am so proud to see you succeed like this! Congratulations! Delighted to see you are back! Congratulations! You are such an inspiration and always make decorating look so easy!! I’m so very happy for you and wish you great success! I will be eagerly awaiting the arrival of your product line. Congratulations! LOL–and how “dare” you tempt us without telling us where and when we can buy these, yummy offerings! Everything looks amazing. Hope they sell in England, eventually. Congratulations! I was wondering why your blog wasn’t current. Can’t wait to see and order your products! You are the reason i have become cookie decorating obsessed and you and your tutorials have always inspired me!! So Happy to See you Here! Many many congratulations. I’m ready to shop! Where do you order your products? I am sooooo very happy for you! Best wishes to you. Love your blog! Muchísimas gracias por compartir! 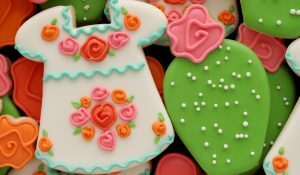 Que emoción tener tantas galletas hermosas por hacer. Tengo dos años haciendo galletas y cada día las amo mas! Yay!!! So exciting!!! Follow your passion, share it with others, and good things will come! So happy for you in this new chapter of your life! No wonder we hadn’t seen you on here (& you didn’t email back in response to my last question! LOL) You took time to help advise me early last year, I believe it was, and it really helped me in MY cookie business 🙂 Good luck in this new venture! Congratulations! I am so excited. I have been wondering where the email’s have been. Good for you. Excited to buy the products!!!! Cheering all the way from VA!!! ??? So excited for you, girl! All that hard work and those late nights have paid off. Couldn’t have happened to a more deserving person! ?? I happened upon your blog four years ago because of your gingerbread playdough recipe and then became inspired by your cookie decorating skills. Yours has been the only blog I use for ideas. I’m so PROUD of you and how far you have come! I feel like I just watched a star be born. 🙂 can’t wait to buy things from your line. Congrats! I knew where you’d been once I saw these products in the “coming soon” section on Karen’s Cookies!! I immediately signed up to be alerted once they’re available. So excited to see your official announcement! I will seriously buy everything with the Sugarbelle name on it. I wouldn’t be where I am today without you, and I’m so excited to be able to show my support and gratitude (not to mention this line looks amazing and i want everything!!) Congratulations to you, my cookie hero. OMG…I am so excited to from you again! Even more excited for you and your new adventure. WOW, this is AMAZING. I wish you the BEST OF LUCK and can’t wait to see, purchase and learn even more from your new products. WELCOME BACK!! Congrats! This is amazing and exciting- good for you! Firstly, is an absolutely brilliant idea! It is really ‘out of the (recipe) box’ thinking! I’m not surprised that it comes from a woman who can pick up a snowman cookie cutter and see a (fill in the blank – a mermaid, an eskimo, a football player, etc, etc). Secondly, you look really pretty in the pic of you visit to American Craft. And thirdly, I’m going to tell everyone who asks me about cookie decorating about this line. 1000x congrats to you!!! I am so excited for you! I can’t wait to get my hands on your products! I e always wondered, if I could make them as good as you? And we’ll maybe now I have a chance! Thank you! I’m a #1 fan! I learned everything about cookies from you… from reading your blog! Thank you. Congratulations! You deserve this! That’s a lovely idea you have to complete your succesfull life! You really inspire us to get a sweet life. Will you ship the products to Brazil? I live here and I,d love to get them. 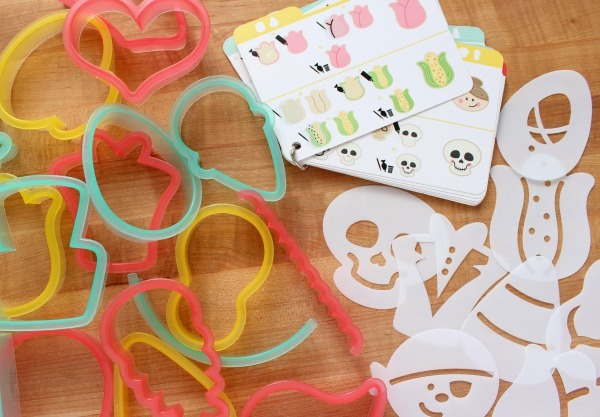 I just noticed that you are a new online teacher for Craftsy as well Callye! So excited with all your news as of late! I am going to register for your class while I patiently wait for Karens Cookies or American Craft to notify me that all your products are now available for purchase! I continue to be one of your loyal “groupies” after all you are the TRUE ROCKSTAR of the rising world of cookie decorating! Wow! I can see how busy you have been! That is so awesome! CONGRATULATIONS!! 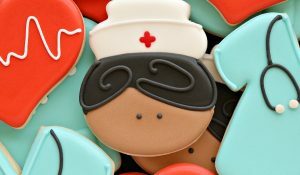 These cookies are probably the cutest cookies I have ever seen…I just love everything that you do! I am so happy that you are teaming with American Crafts and will be selling your product line. I know that American Crafts is in Orem, do you also live in Utah? I live in central Utah. It is a great place to live! And so many people like you with such great talents like this who are willing to share them with the rest of us! Thank you SO much! Enjoy your new journey! ? Congrats! This is such a blessing! Just so you know, I would not be where I am today without “consulting” you every time! Congratulations to you! What wonderful news! You are definitely an inspiration to many of us home bakers out here. I’m looking forward to many wonderful products in your new line and also to future posts! Congratulations!!!!! You taugh me so much when I first started my cookie business. You are an inspiration and I can’t wait to buy your products? OMG! This is amazing! Congratulations! I have been coming to your blog for a couple years now. I use your sugar cookie recipe as well as MANY of your techniques. I get a lot of my inspiration from YOU! I think you’re amazing and this is so well deserved ? So very happy for you!!! You certainly deserve all the best! 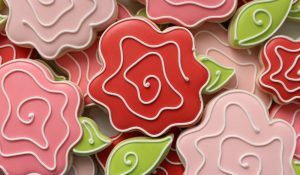 Your blog has helped me become a better cookie decorator and I will be forever grateful for that. Can’t wait to start shopping! Congratulations! I was hoping it was something good that was keeping you away. I always pop in here whenever I decide to decorate cookies so I can get inspiration and icing directions. Thanks! AWESOME!! So HAPPY, EXCITED & PROUD FOR YOU!!! Can’t wait to see the line. CONGRATULATIONS!!!!! Congratulations! Can’t wait to check it out! Best of luck! Crazy cool! And very inspiring! Congrats! amazing! can’t wait to see everything! No one deserves it more than you!!! You’re a fabulous teacher and an amazing artist! Can’t wait to buy some of your new products!! Yay!! ???? Glad to see you back! Can’t wait to get my hands on these awesome products!!! Recipe box is to die for! When I started my cookie venture, you were the first one that I continually stalked (lol). Thank you for allowing me to learn so much from your posts, tutorials and oopsies! Thank you for allowing me to walk this cookie road behind you! I can hardly wait to see what you’ve created 🙂 May the Lord continue to open doors to your creativity! You deserve it! Congratulations!!! I can’t wait to get my hands on your products!